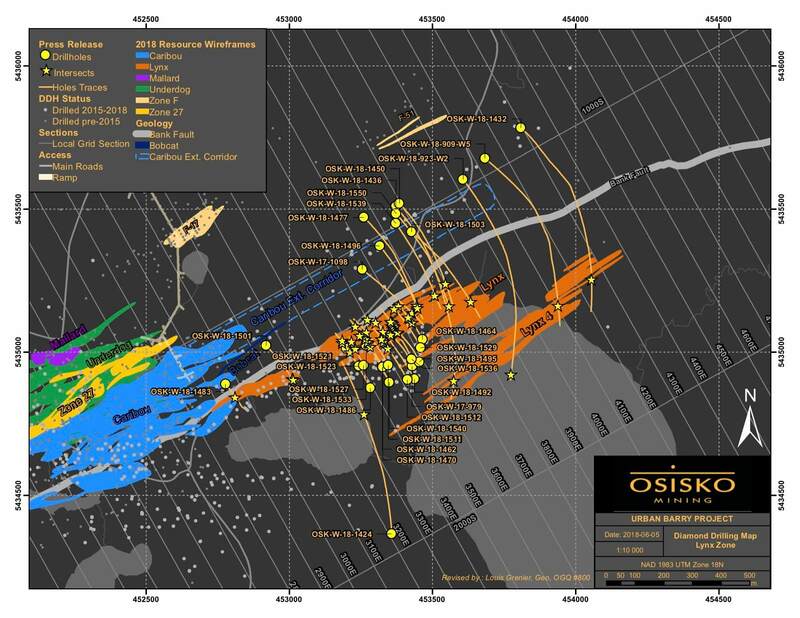 The Windfall Lake property is 100% owned by Osisko Mining Inc. and consisted of 285 individual claims covering an aggregate area of 12,467 hectares. The Windfall Lake project, located in the Abitibi greenstone belt, Urban Township, Eeyou Istchee James Bay, Québec, Canada is 700 kilometres north-northwest of Montréal, 200 kilometres northeast of Val-d’Or and 115 kilometres east of Lebel-sur-Quévillon. 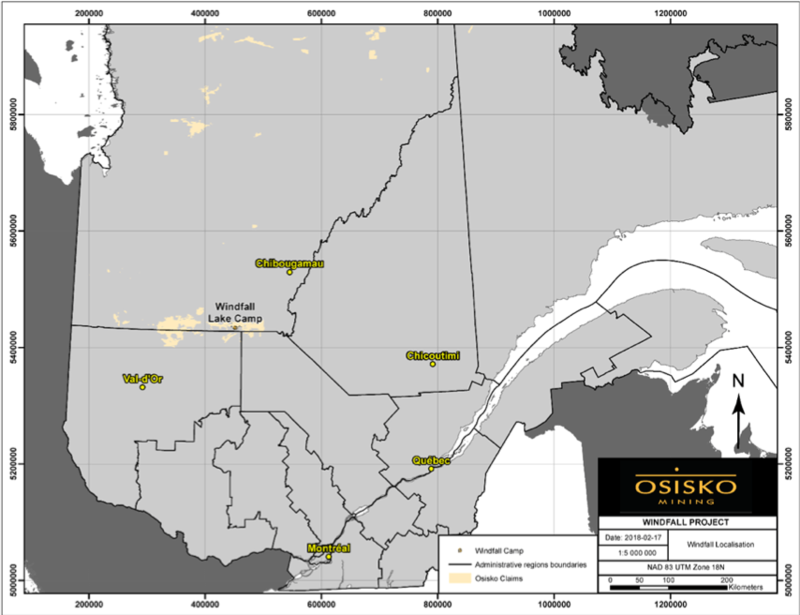 The Windfall Lake Gold project falls within the traditional territory of the Waswanipi Cree First Nation. 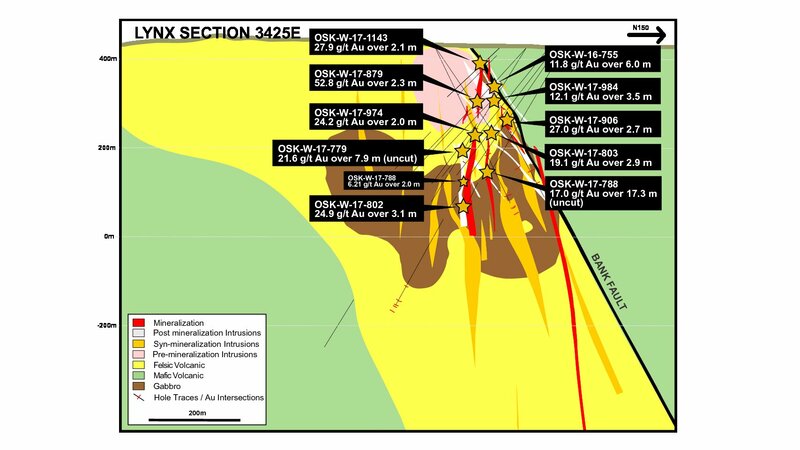 The most significant gold mineralization defined to date is currently known for a vertical extent of approximately 1200 metres in 4 zones; Main Zone (Zone 27, Caribou and Mallard), Underdog, Lynx, and F-Zones. 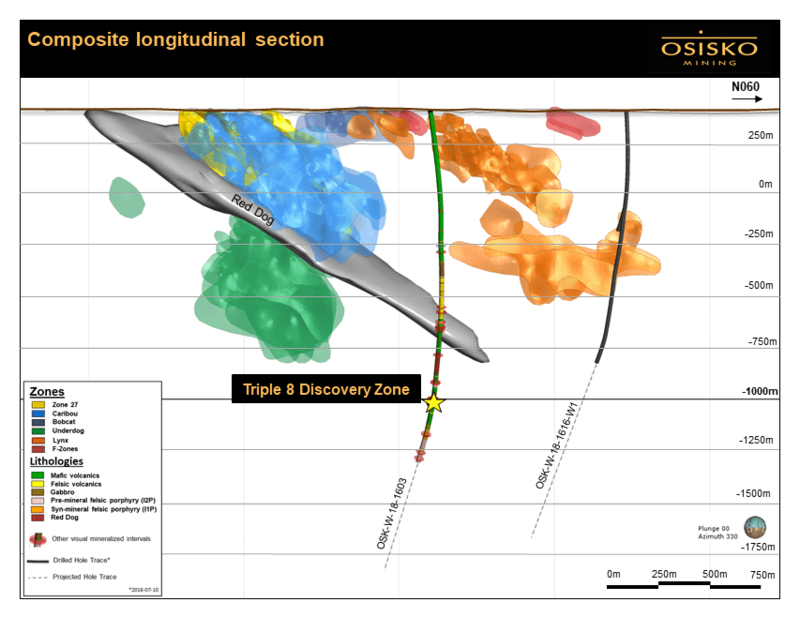 Additional gold mineralization was discovered in July 2018 in the new “Triple 8 Zone”. The Main Zone is subdivided into a series of sub parallel lenses along the corridors of Zone 27, Caribou, and Mallard, that all have the same style of mineralization. The gold mineralization occurs in several sub-vertical, northeast-trending lenses measuring between 2 to 12 metres. 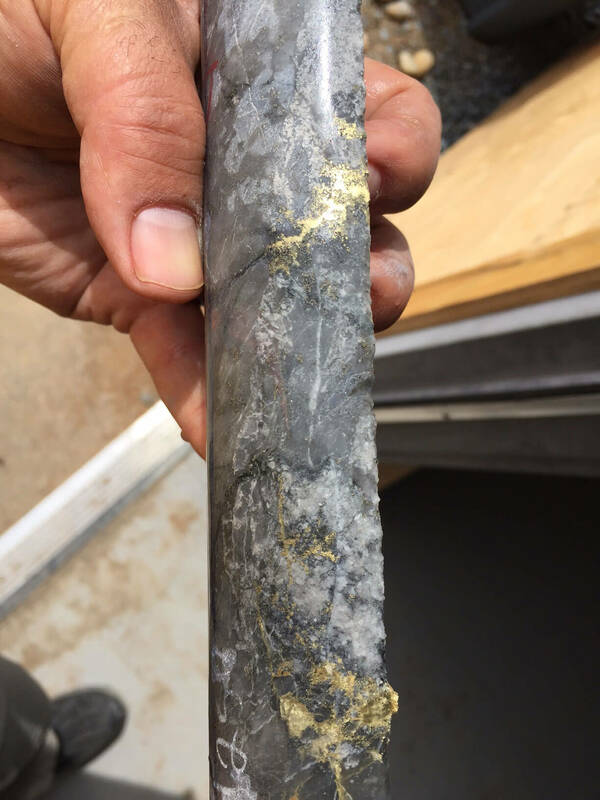 The gold mineralization contains gold bearing pyrite veinlets that are controlled by the contacts of the quartz porphyry dikes and can expand into the dike or several metres into the hanging wall and footwall rocks. 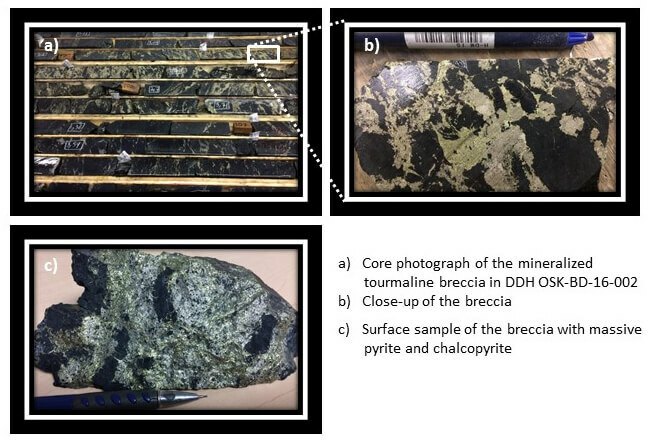 Pyrite dominantly occurs as disseminations and as diffuse stockworks (breccias) of veinlets that locally contain significant amounts of tourmaline, Fe-carbonates and locally traces of chalcopyrite and sphalerite. Proximal to the mineralized intervals, the rocks have an alteration assemblage consisting of sericite > pyrite > silica > chlorite. The volcanic rocks and quartz-feldspar porphyry dikes that are spatially close to the mineralized zone contain strong pervasive and/or banded sericite, and pervasive or patchy silica alteration. The main lithological feature of the Underdog mineralized zone is a large composite felsic to intermediate porphyritic stock hosted in low angle dipping felsic to mafic volcanic rocks. The stock is later intruded by two smaller volumetric phases, including a quartz-feldspar-plagioclase porphyry dike with biotitic and sericitic alteration, and a quartz porphyry dike with silica-sericite (tourmaline) alteration. 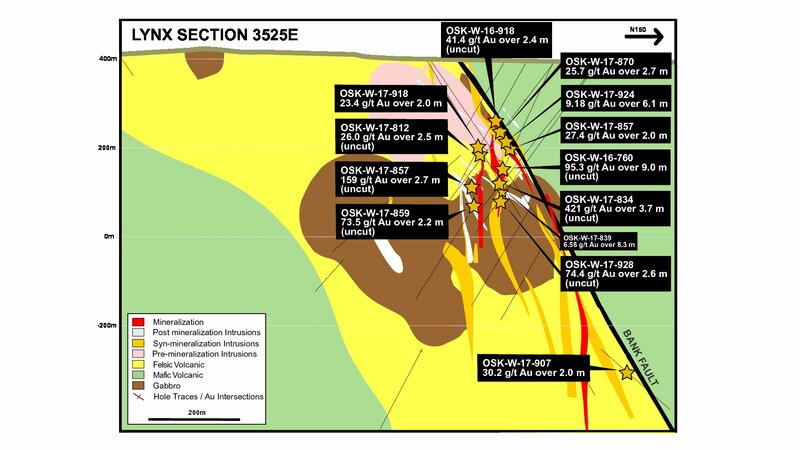 The dikes may have acted as conduits for gold-rich hydrothermal fluids, an interpretation that is reinforced by the presence of strong sericite (+/-) silica alteration coupled with gold mineralization found proximal to the dike contacts. 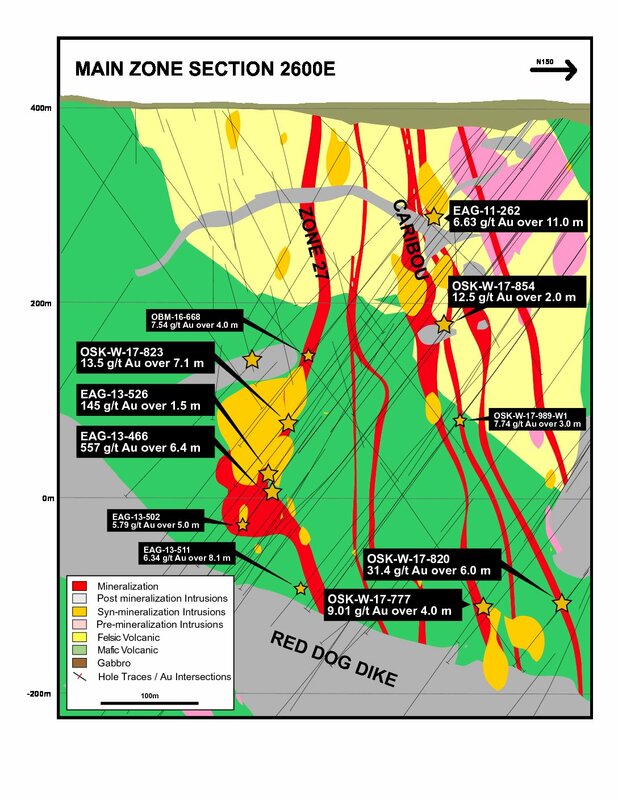 The gold mineralization is recognized as sub-vertical to steeply dipping envelopes with true widths averaging 2 to 8 metres and oriented east-northeast. Sulphide minerals include pyrite ± sphalerite-chalcopyrite-molybdenite and occur as disseminations and as stringers typically millimetric in size. 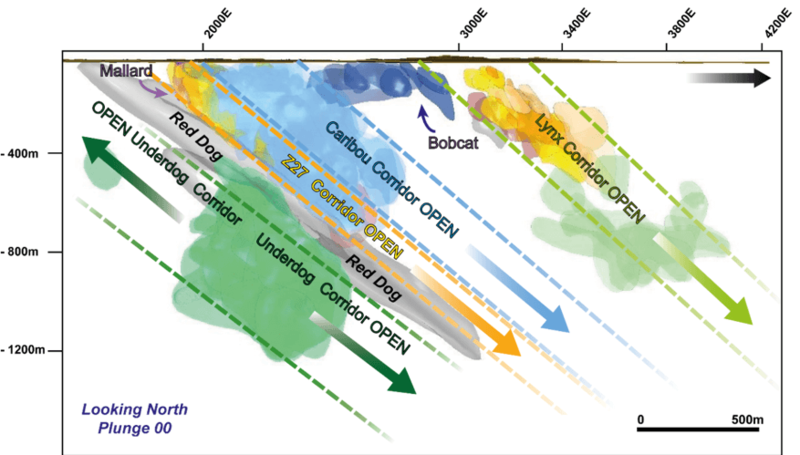 The geological interpretation for the Lynx zone is based on the relative timing of rock units and the spatial relationship of the gold mineralization with the syn-mineral dikes. The Lynx zone is often constrained to the silicified-sericitized contacts of the large quartz eyes felsic porphyry intrusive with the other rock types. 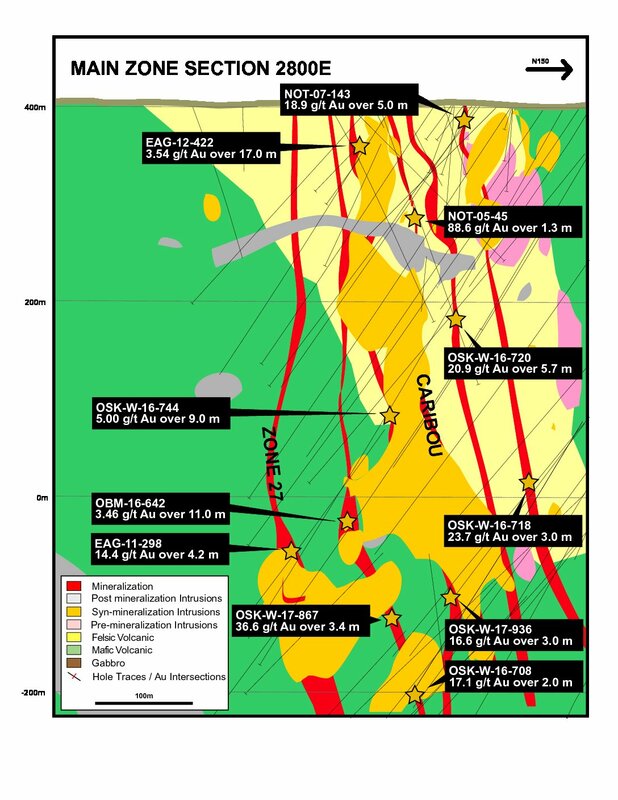 A second significant gold mineralization is hosted within crustiform veins generally occurring near the upper contacts of the gabbro with the other rock types. The most significant mineralized intervals, locally with visible gold, are often related to pervasive silica flooding or crustiform-like veining. 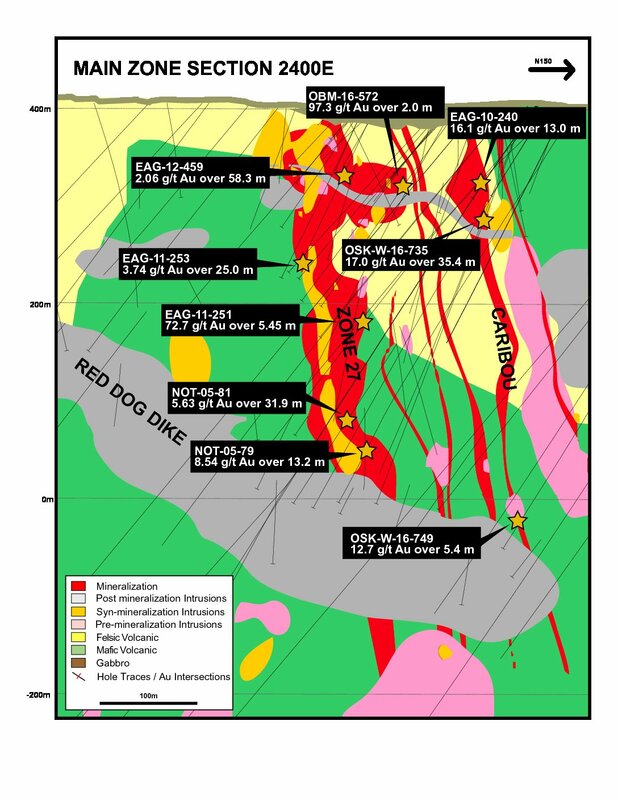 Mineralization in the Lynx zone is recognized as sub-vertical to steeply dipping envelopes, with true widths averaging 2 to 6 metres and oriented east-northeast. 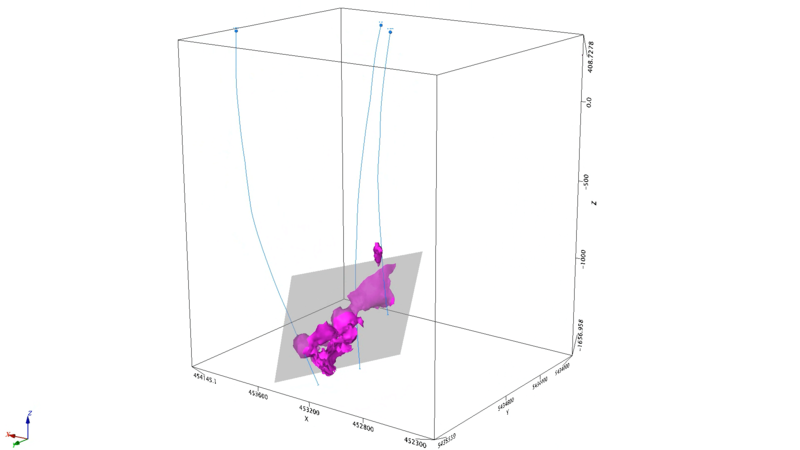 The mineralized F-zones are of second order in terms of scale compared to the zones composing the main Windfall Lake deposit. 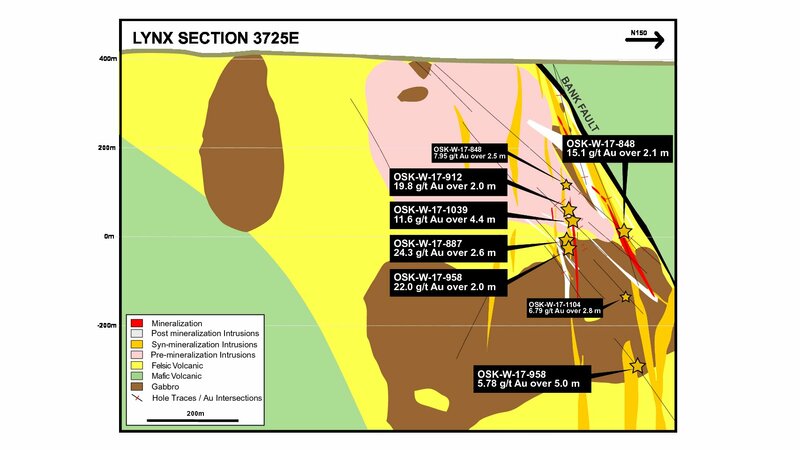 The F-17 and F-51 zones are two separate zones of gold mineralization containing typical orogenic gold mineralization (also termed greenstone-hosted quartz-carbonate vein mineralization). 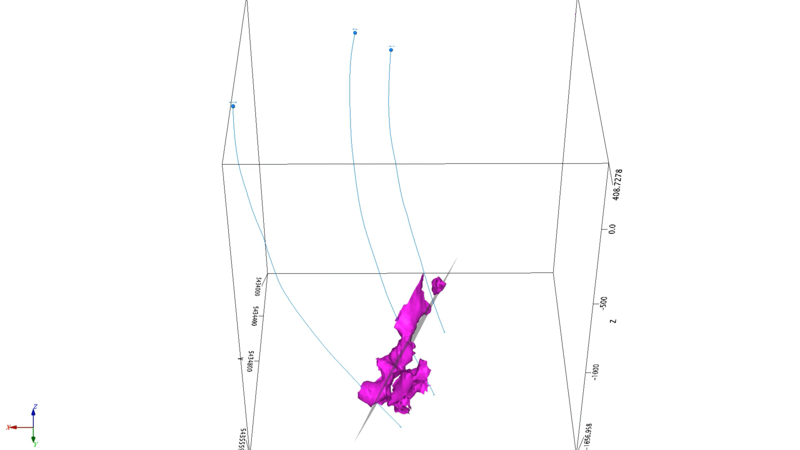 The two zones, located approximately 450 m north-northeast from the Main zone, trend subparallel to the Main zone along a shear zone and dip steeply to the north. 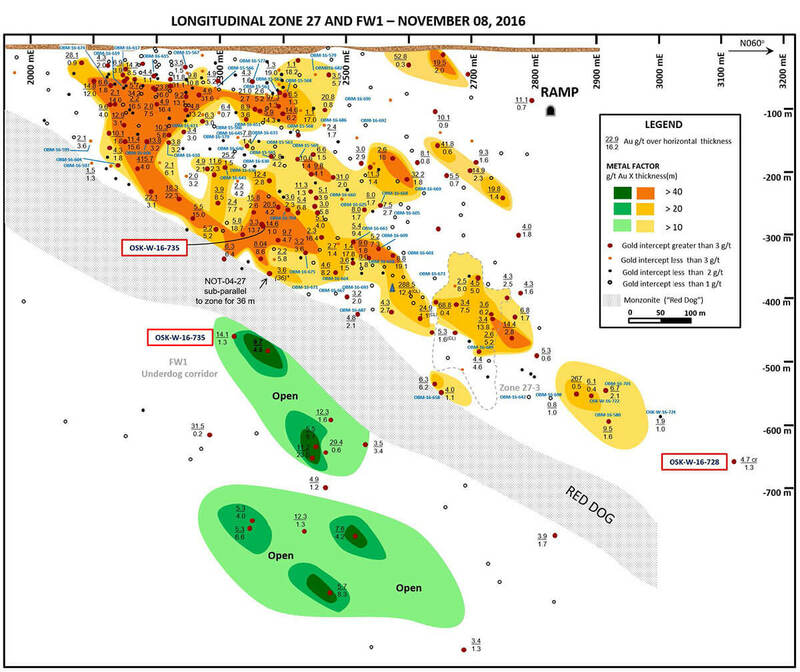 Both zones are aligned along the same trend but separated by approximately 500 m. Zones F-17 and F-51 are characterized by multiple quartz-feldspar porphyry dikes cross-cutting host mafic volcanic rocks. 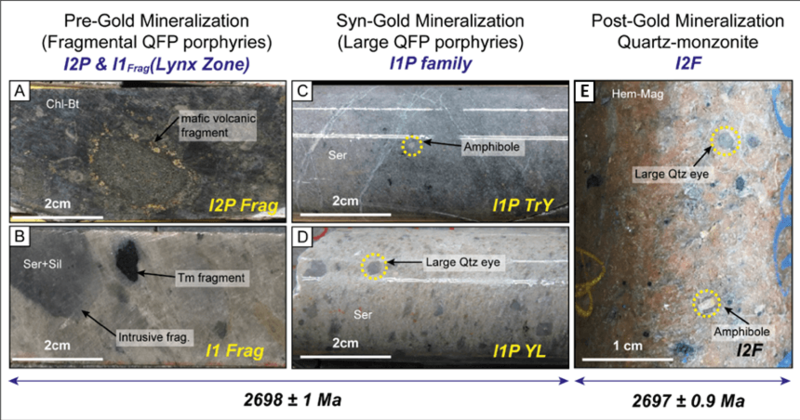 Gold mineralization is spatially associated with quartz-porphyry dikes restricted to the shear zone. Gold-associated alteration in F-17 and F-51 mineral zones consists of pervasive sericite-carbonate ± silica alteration. 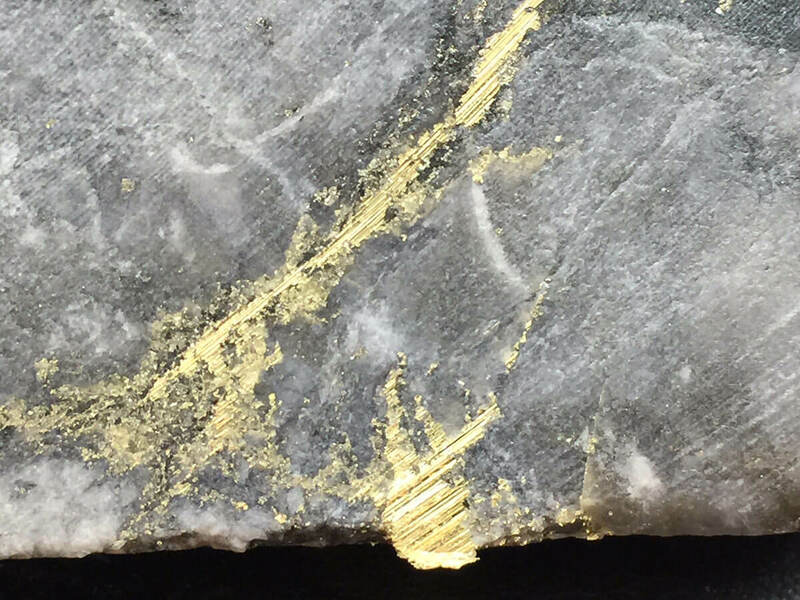 Gold mineralization is hosted in pyrite veinlets, quartz-ankerite-pyrite veins and silica-tourmaline-pyrite breccias. 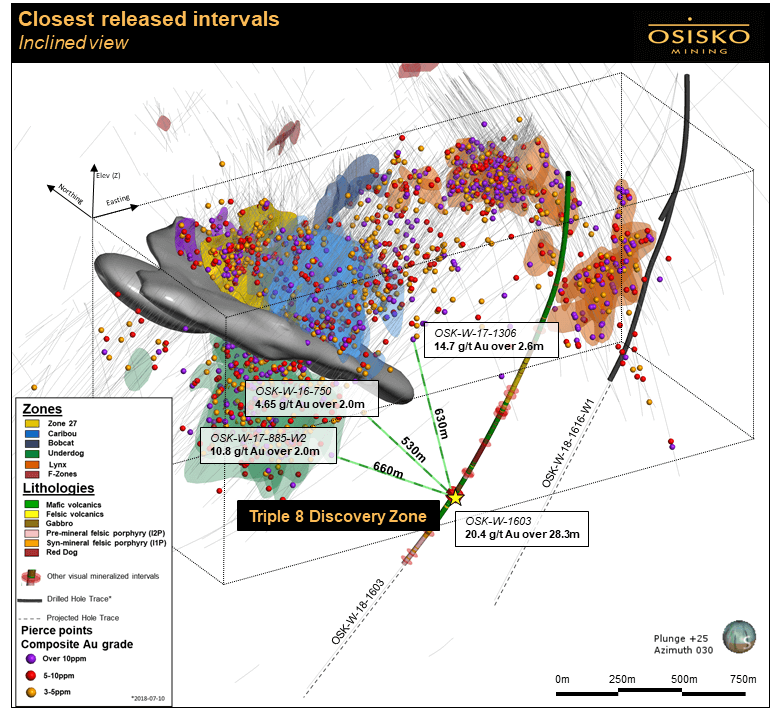 The new “Triple 8 Zone” was discovered in Deep Underdog hole DDH OSK-W-18-1603. 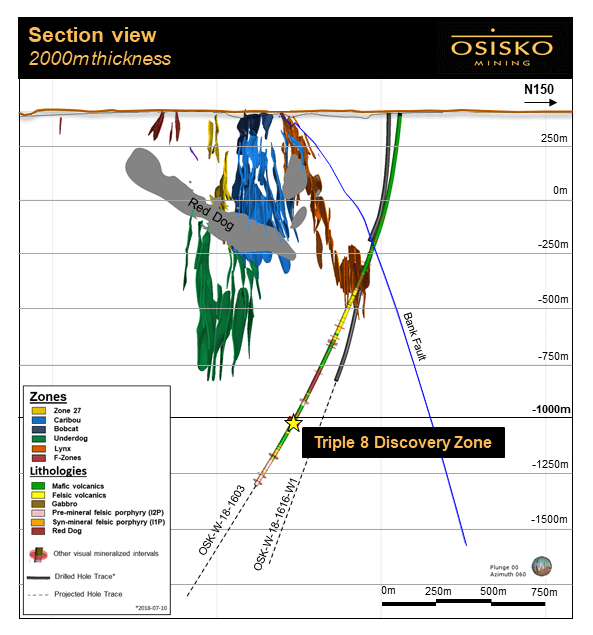 Triple 8 was an unanticipated zone of mineralization intersected at approximately 1500 metres downhole. 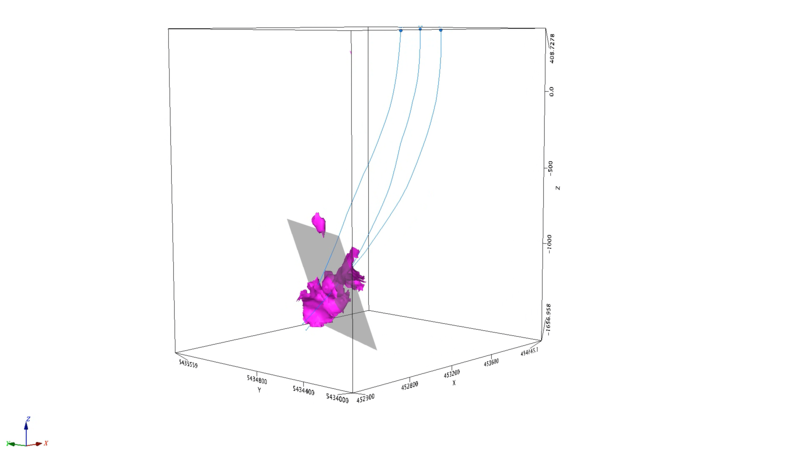 Triple 8 does not correlate with any known zone and is approximately 660 metres east from the closest known mineralized intercept in the Underdog Zone. This appears to be a new style of mineralization at Windfall, as mineralizing fluids followed flow contacts inside the andesite host rather than felsic intrusive contacts (no intrusion is directly associated with this Triple 8 intersection). The zone also contains minor, chalcopyrite, pyrrhotite, arsenopyrite and anomalous molybdenum and zinc values. 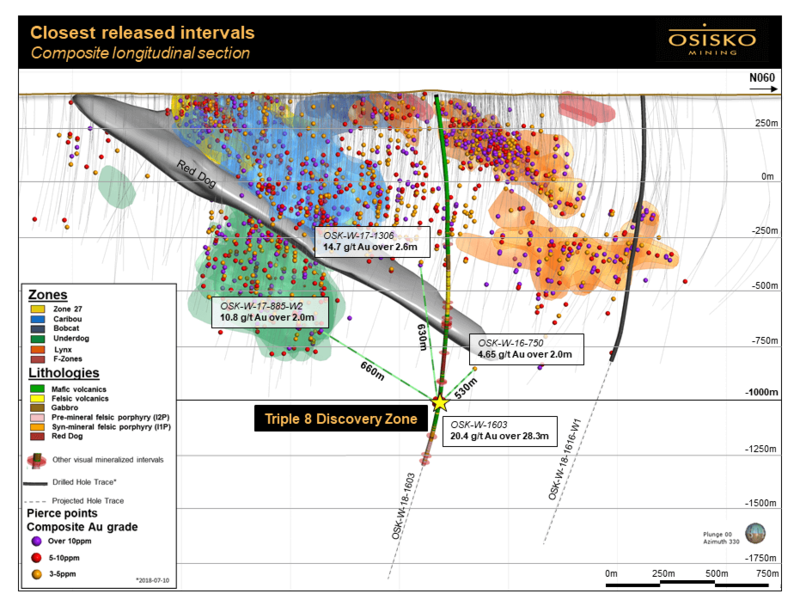 The new discovery zone falls well outside the area of the recently announced mineral resource estimate for the Windfall gold deposit. 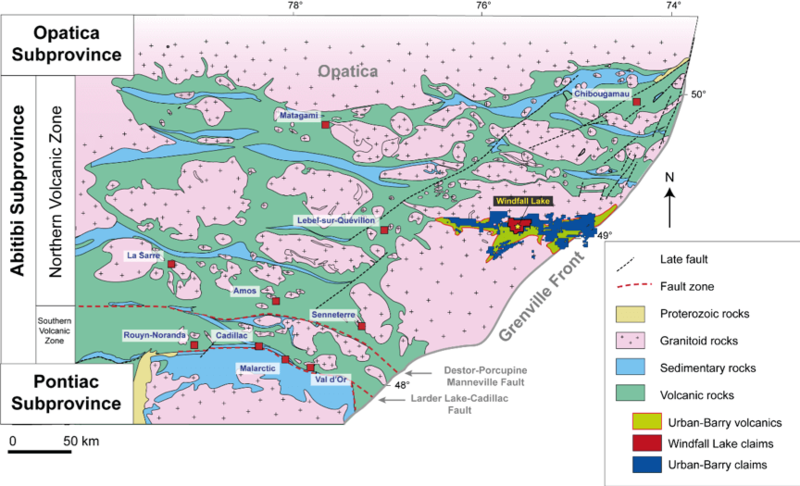 The Windfall Lake deposit occurs within the Urban-Barry greenstone belt in the Northern Volcanic Zone of the Abitibi geological subprovince. The Urban-Barry greenstone belt has an east-west extent of 135 kilometres and is 4 to 20 kilometres wide. 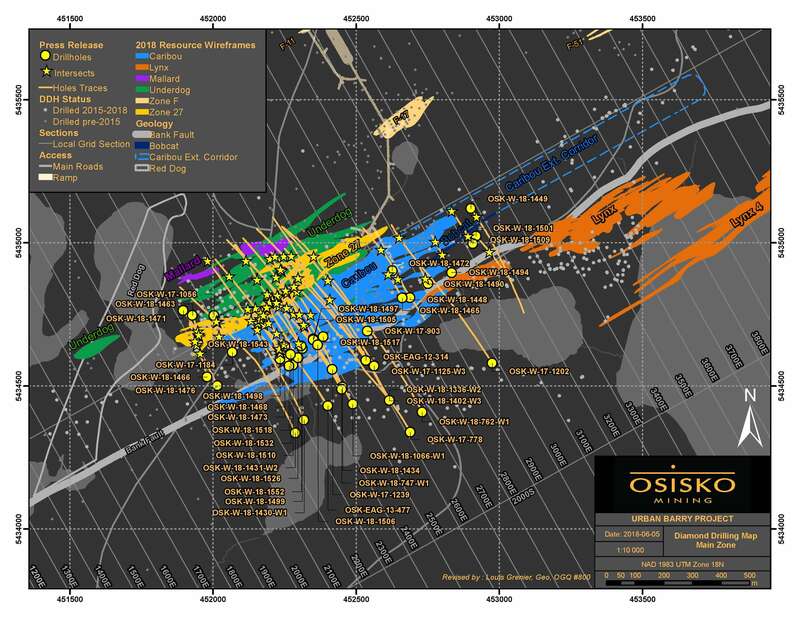 Osisko mining is currently the largest stakeholder in the Urban Barry greenstone belt with over 40% of the land staked. The Urban Barry greenstone belt contains mafic to felsic volcanic rock units and is cross-cut by several east-trending and east-northeast trending shear zones that delineate major structural domains. In the Windfall Lake deposit area, volcanic rocks are intruded by a series of younger quartz-feldspar porphyry dikes. All dikes and volcanic rocks are affected by the regional foliation. The intensity of the foliation and the overall strain vary greatly within individual rock units. 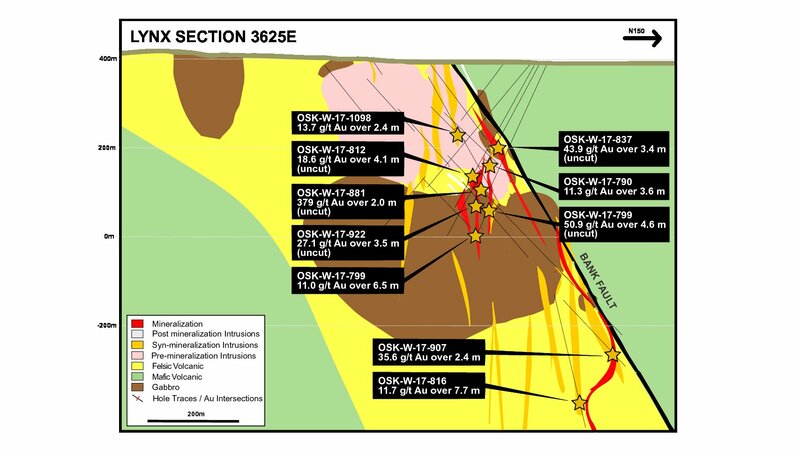 At Windfall, the main gold event is temporally and spatially constrained by the emplacement of quartz porphyry dikes. The major dikes found at the Windfall Lake deposit are separated into 3 groups: pre-mineral dikes, syn-mineral dikes and post mineral dikes. The fragmental granodiorite porphyry dike unit is characterized by 2 to 10% small quartz eyes generally less than 2 millimetres in diameter (Photo A). This unit has internal texture variations ranging from massive and porphyritic to fragmental with up to 30% sub-angular to sub-rounded fragments. The fragments are generally 1 centimetre in diameter but can reach up to 10 centimetres locally. Fragments are comprised of volcanic fragments, both intermediate and felsic compositions, that are locally sericitized and pyritized. In the Lynx zone, another intrusive phase is present and is differentiated by it’s abundance of intrusive fragments that contain large quartz eyes and pyrite disseminations, minor felsic volcanic fragments, and pyrite-replaced fragments. Additionally, it contains abundant, angular, strongly tourmaline-altered fragments of unknown origin, which is unique to this unit (Photo B). This unit is generally moderately to strongly sericite-silica-altered. Underdog mineralized zone are distinguished by the presence of large, often ghostly-textured feldspar phenocrysts (5 to 10%) accompanying the quartz eyes. Although gold mineralization is found in all rock units, including host volcanic sequences and pre- and post-mineral dikes, it is generally more abundant within or proximal to those large quartz eyes porphyry dikes. 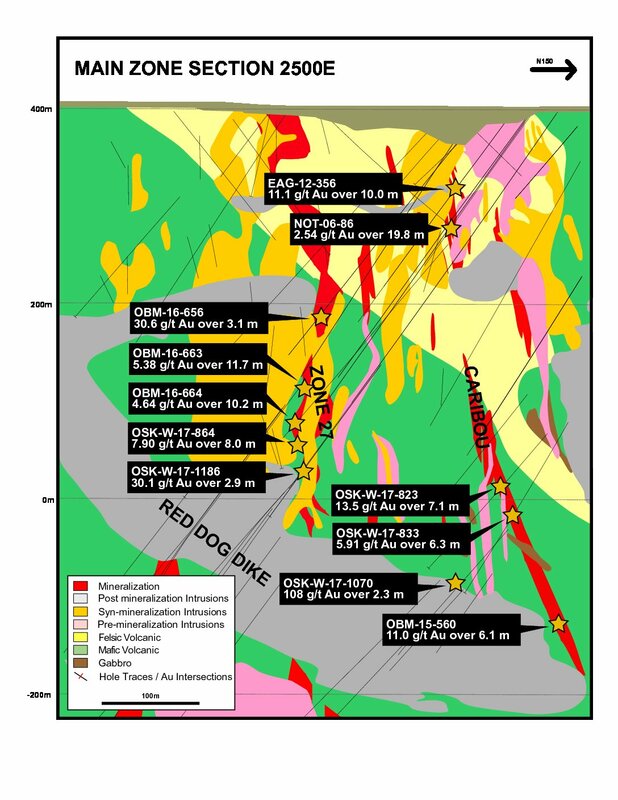 The quartz monzonite dike, or Red Dog, is a 100 metres thick unit cross-cuts all the others volcanic and felsic porphyry units and locally hosts gold-bearing quartz-carbonate tension veins. This unit is the most obvious of all the porphyry rock units due to its brick red colour (Photo E) due to the hematite content. The fine grained quartz monzonite dikes are fine-grained equivalents of the Red Dog unit. They form sub-horizontal to horizontal dikes that lie generally at 10 to 50 metres above the Red Dog unit. The dikes are less than 10 metres thick and cross-cut andesite units, and felsic/intermediate porphyries. The quartz monzonite dikes are pinkish red, fine-grained and massive and are weakly to moderately magnetic. They generally have traces of quartz eyes smaller than 0.5 millimetres. The fine-grained quartz monzonite unit consists of metric-scale sub-horizontal dikes that can reach up to 20 metres in thickness. 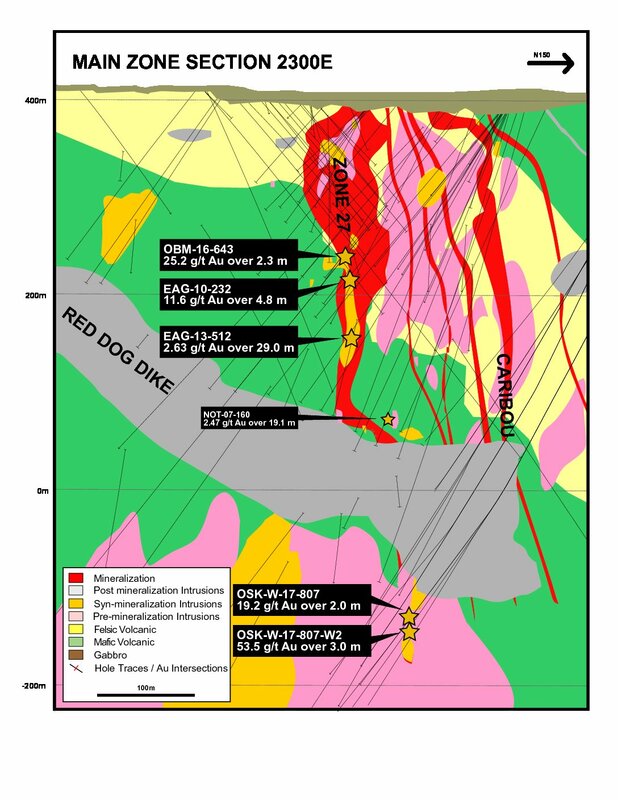 They are interpreted as a later intrusive unit as it cross-cuts all other rock units including the Red Dog. This unit is pinkish to slightly orange and is fine to medium grained and homogeneous, non-magnetic, and contains less than 1% quartz eyes smaller than 2 millimetres. 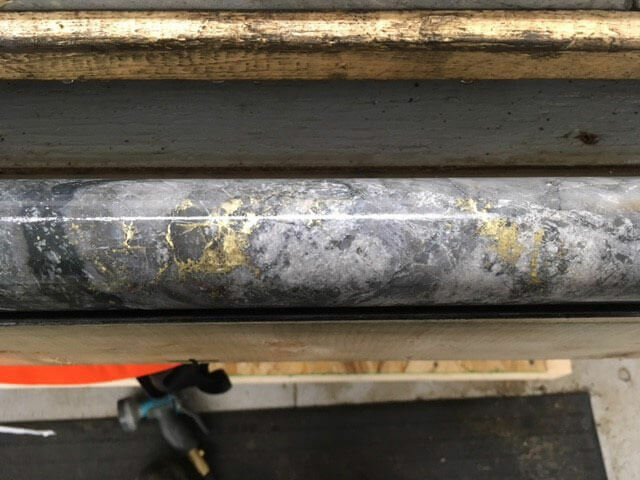 This unit is associated with gold mineralization at the Fox gold occurrence, located northwest of the Windfall Lake deposit, and occurs within sericite- and silica-rich alteration envelope at the contacts with the host rock. Intermediate to mafic green dikes are characterized by medium to dark green colour and are fine- to coarse-grained. These are generally non-magnetic, massive to weakly foliated, and characterized by chlorite and carbonate alteration. They are oriented north-northeast and dip shallowly to the east-southeast. They are a minor unit and cross-cut all volcanic and intrusive units and are therefore the latest magmatic event at Windfall. Photos: A) Common pyritized mafic volcanic fragments hosted in pre-mineral fragmental granodiorite porphyry dikes; B) Magmatic-hydrothermal breccia in the Lynx zone; C-D) The syn-mineral granodiorite large quartz eyes porphyry dikes are generally sericite-altered and contain traces to 10% of larger quartz eyes and is intimately associated with the pyrite-rich gold mineralization; E) The quartz monzonite Red Dog unit contains similar large quartz eyes as in the large quartz eyes porphyry dikes but its groundmass is well crystallized; the Red Dog unit cross-cuts the gold-bearing pyrite stockwork. 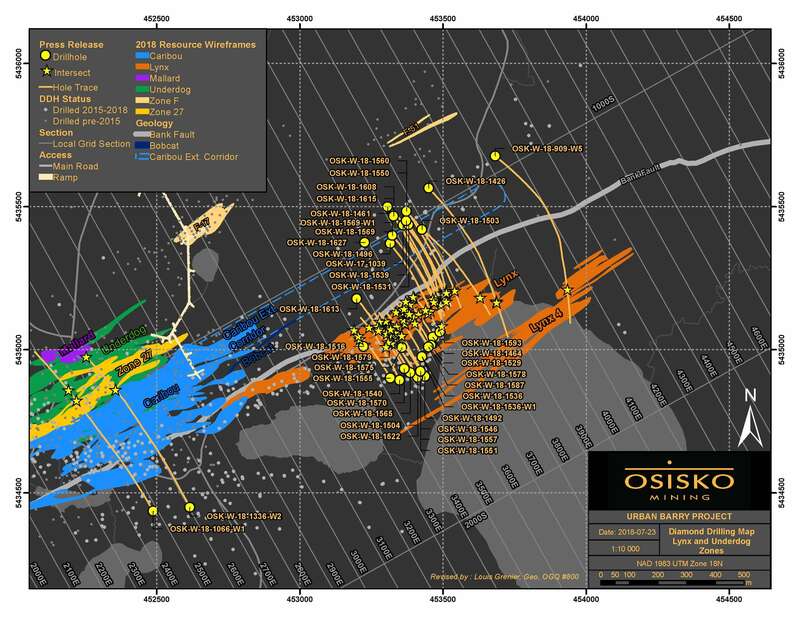 Reference photos are from Osisko’s drill core. The mafic volcanic rocks are of tholeiitic affinity and are constituted by basalts and andesites in composition. They consist of massive, pillowed, fragmental, and breccia flows that are locally vesicular or porphyritic with phenocrysts of plagioclase. The rock is commonly fine grained, medium green to dark green in colour, and is weakly to moderately foliated. The felsic volcanic rocks are dacitic to rhyolitic in composition and consist of massive and breccia flows that are often porphyritic containing small (1 to 3 millimetres) phenocrysts of quartz that vary in abundance from 2 to 10%. The rock is commonly fine grained, yellowish beige in colour that can locally be green when chloritized and is weakly to moderately foliated. Felsic volcanics are stratigraphically located above the mafic volcanics. In the Lynx zone, a gabbroic sill was injected in the felsic volcanics prior to the emplacement of pre- to syn-mineralized quartz-feldspar porphyry dikes. Both the felsic volcanics and the gabbroic sill are affected by the deformation associated to the Bank Fault, inducing a parallelization along the deformation zone, verticalizing the units along its contact and locally dismembering the gabbro. 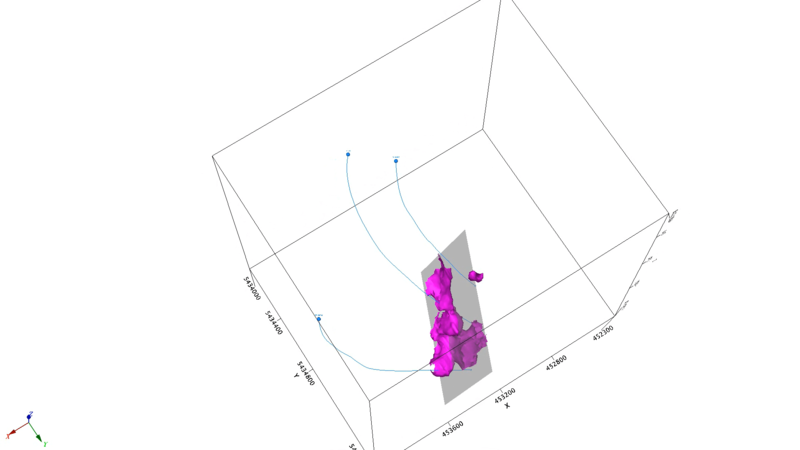 The Windfall Lake deposit most likely represents an Archean intrusion-related hydrothermal gold system. 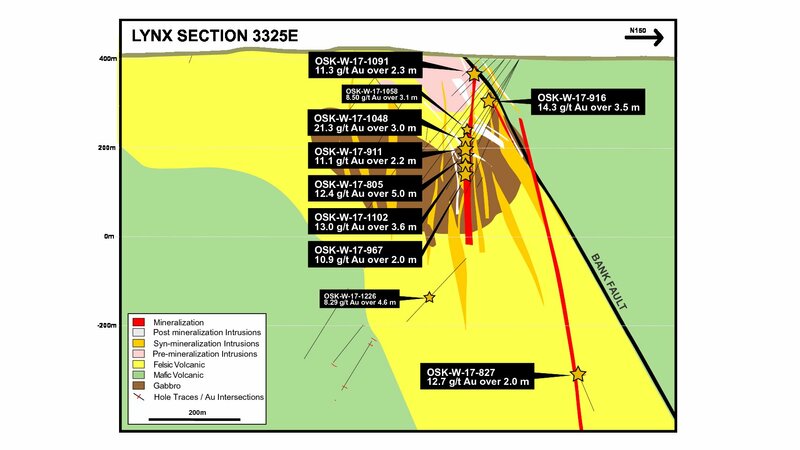 The term intrusion-related gold systems (“IRGS”) is a relatively newly defined gold deposit class and has been described in recent years by many publications. 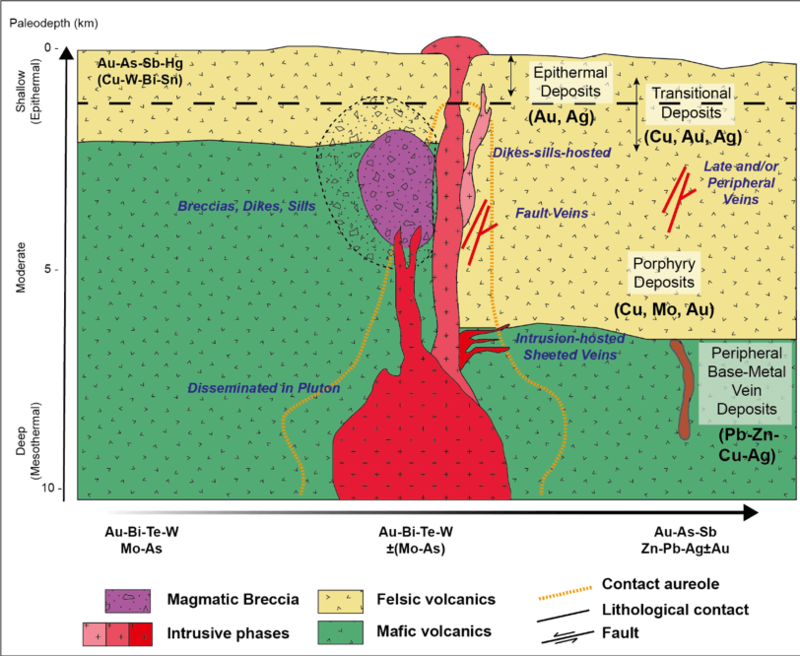 IRGS are defined as magmatic-hydrothermal systems where gold mineralization is hosted primarily within the intrusions or in the immediate wall rocks of these intrusions. 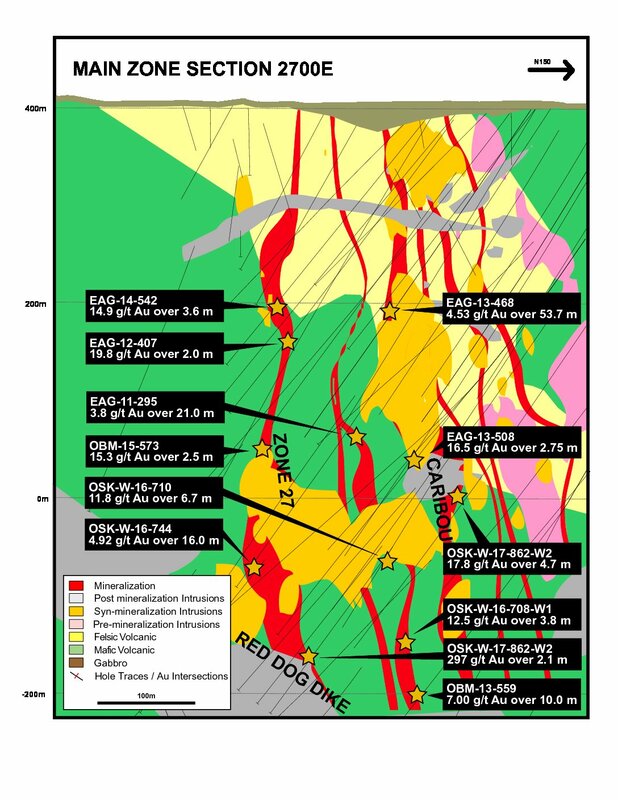 The porphyry intrusions in the Windfall Lake area are likely the source and a major factor controlling the occurrence of gold mineralization.